The New Movement in New Orleans is one of the dopest theaters in the city. They host improv, standup, sketch, variety shows, bit shows, etc. It is so much fun to hang out there! The theater is set up perfectly, you can order at the bar from inside or out. One of my favorite things to see at TNM was when Nikki Black opened for Shane Mauss. That was really cool. Anyway, the bathroom is located just to the left of the bar (inside, downstairs). There are two stalls for the women. The vibe is very "yes, and," hipstery, bohemian, whatever you want to call it. The TP is hooked onto a rope. The best part about it having this kind of vibe is that everyone using the ladies' is super respectful. Yes, and... we all wanna use the toilet, so please keep it clean. 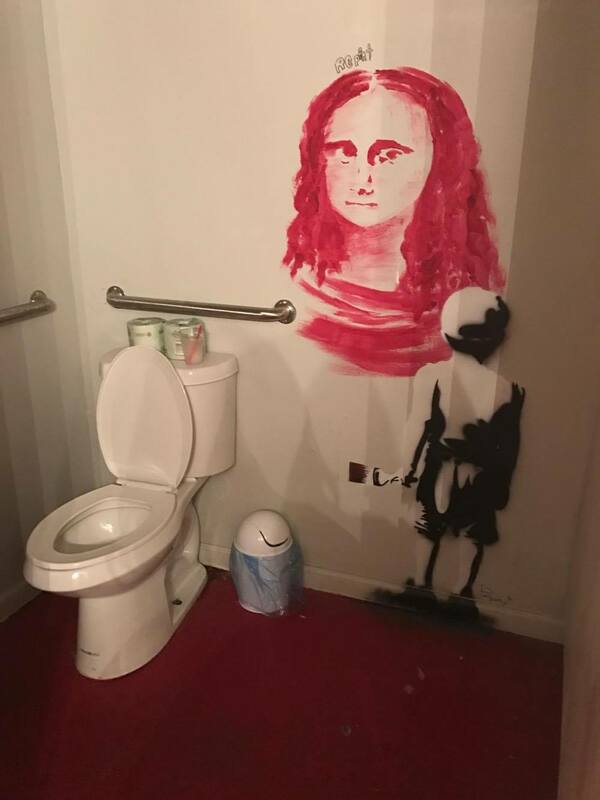 There are some banksy-esque pieces on the wall, what do we call those? Murals? Paintings? Stencilings? IDK. To be honest I had one of those things and it was a wall decal in my old house, and I started to think it wasn't cool and that banksy wasn't really that cool and I started feeling like a poser. These paintings weren't like that, they were actually painted onto the walls and still had a slight tinge of anarchy to them, unlike the decal which I believe they sell at walmart now. When I was there the bathroom was always clean and there was rarely a line, even though it was a big party with a bunch of people. There is another bathroom upstairs but I'm not sure if that one is just for performers so I'm not going to review it, but I will say it was clean as well. Generally, I liked the bathroom, didn't cry in there one time which was sweet and unusual for me! I did do my makeup there one night, traveling you know, and I will say the lighting was good and I found enough space where I wasn't juggling too many products at once. Way to go the New Movement. Four Smiling Poop Emojis since, you know, no free tampons.